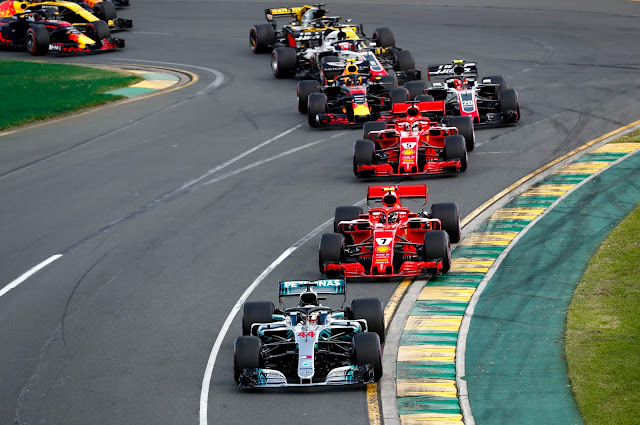 Our intrepid race reviewer Matt 'Trumpets' Ragsdale gets into the nitty gritty of what unfolded in a tense and captivating Australian GP. Well, that didn't take long. One minute, the top three contenders were separated by a mere tenth, and the three way battle for the championship was very much on, the next, Hamilton was the better part of a second up the road and Merc once again was going to walk it home, putting RBR's dominant dynasty to shame and chasing the scarlet glories of Ferrari's uber dominance. But hope springs eternal, and where tires have to be managed, there's always a potential door for challenger's to wander through. If you happen to be a fan of the Scuderia, putting early pressure on Lewis and getting him to overheat his tyres is the way to go, forcing Merc into an extra stop. Likewise, if you happen to be a fan of a certain energy drinks team, you'd like to see both teams ahead struggle to get their tyres into the proper window. Unfortunately, the window for both the Supers and Ultra is pretty much a circle in the Venn diagram universe. 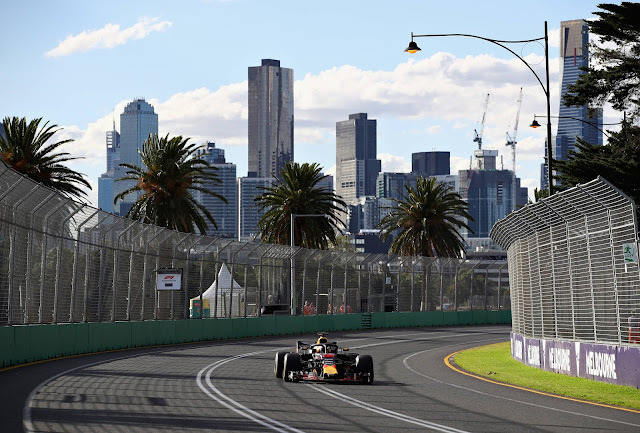 Bottas from P15 and Ricciardo from P8 will be the motivating factor for the early part of the race as they attempt to limit their self-inflicted damage. 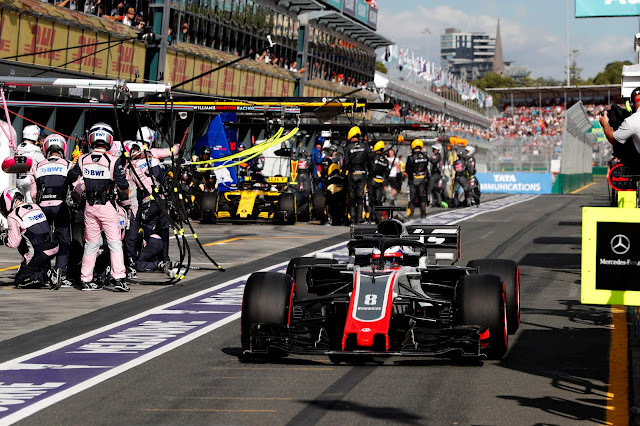 The other factor will be the robust defense of HAAS, who will be doing their dead level best to hold onto their P5 and P6 best of the rest start for as long as possible. Renault look to be their nearest competitor but Macca will want a piece of the pie should any crumbs come rolling their direction. A far cry from their pre season predictions of tilting with the Bulls, but Bottas' self inflicted wound at least gifted them a face saving P10. Lights Out!!!! And it was a crushing start from Raikkonen, Hamilton just covered it, with Vettel on the outside and Verstappen on the inside. Raikkonen kept up the pressure but couldn't find a way through. Magnussen took full advantage of the young Dutchmaen's adventures on the dubious parts of the track to take P4 away from him. Alonso had a proper go at Sainz, who was having none of it as they went side by side before the younger Spaniard forced his elder too yield. Lap 6 and a dive bomb by Ricciardo up the inside on Hulkenberg, a brief riposte but job done and place gained. 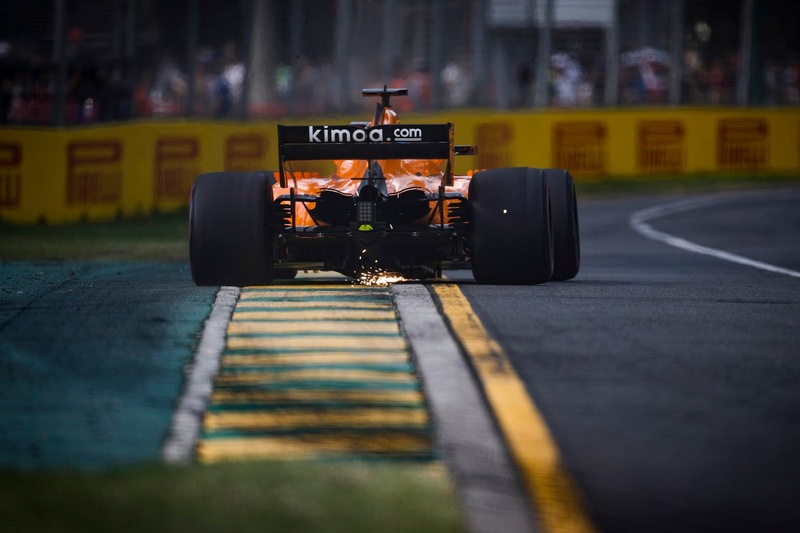 Slightly less happy was his teammate up the road, asking for help with the battery to aid his overtake on Magnussen, who was rapidly becoming accustomed to his new abode. Adding to Verstappen's woes, his tyres were starting to overheat. Lap 6 also saw the end of Sirotkin's day, with some thoroughly toasted brakes. Sergei smartly parked it up at the end of an escape road. Also suffering with mechanical problems the following lap was Ericsson, with a loss of power steering. That ended his outing, and gifted his teammate first blood in the teammate battles. Bottas finally started to get a move on, up to P13 on lap 9, but already a full pit stop behind his teammate, swanning about at the front of the race. But it was T1 on lap 10 and Verstappen full on 360'd his car, losing 3 spots, confirming Kmag in P4 and leaving Ricciardo chasing down Grosjean for P5 as Verstappen wandered back into P8 with the puzzle of Hulkenberg directly ahead of him and his day fairly well ruined. Raikkonen was given the call to move on Hamilton lap 12, to bring him into range for the undercut before the pit stop window was opened. Lap 15 and it was ominous times for Gasly, who slowed suddenly with white smoke pouring out the back and over the radio he was urged to try and make it to the pits. 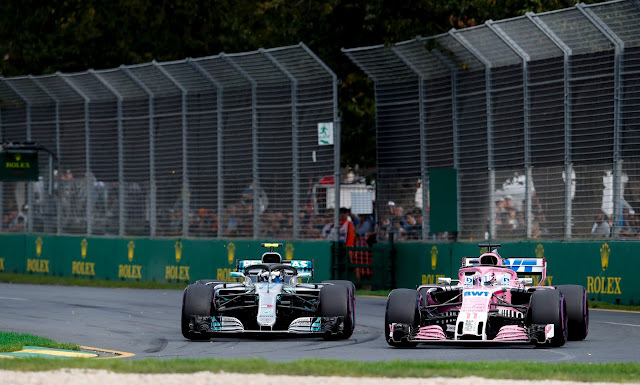 Bottas meanwhile, was unable to make much progress on Perez, despite lingering well within the tripartite DRS zone on the Force India. Perhaps the new regulations on PU equity were paying dividends after all. Lap 19 Raikkonen was into the pits for the undercut and out on the Soft tyre. This brought him out just ahead of Magnussen and Mercedes reacted immediately, calling for Lewis to pit. Out on a pair of Softs, and no real worries from Raikkonen it was status quo, but with Vettel lingering at the front and Ferrari splitting their strategy. Vettel was not the only runner to stay out past the optimum lap, as Ricciardo too was now hoisted onto the pace of the HAAS ahead, keeping Bottas stuck in his pit window. The only way out was forward, as the undercut would be useless with that kind of traffic to hold him up. Of course, Ricciardo was running the Supers, so it was less of a problem for him. Lap 22, and Verstappen was in, the following lap saw KMag in and out just behind Verstappen. Not for long though as he rolled to a stop with reported suspension failure, crushing his dreams of a top 5 result. During all that excitement, Sainz had a massive off, allowing Alonso by. It was an unsafe release, not a suspension failure and it was lap 25 that Grosjean was in, and out, and then pulling off as well on the exit of T2. Mega disaster for HAAS and Bang!! Virtual Safety car. Lap 26 Bottas, and Vandoorne were in. Vettel was in as well and managed to get out in FRONT of Hamilton, who was utterly and completely blindsided. Alonso felt hard done by as Verstappen came round the outside of him as he emerged from the pits. Crikey!! Lap 28 and full on Safety Car as the marshals could not clear Grosjean's car without mechanical assistance. Hamilton was on the radio, trying to determine how exactly Vettel pulled off his miraculous overtake, demanding to know if it was his mistake with sector times. 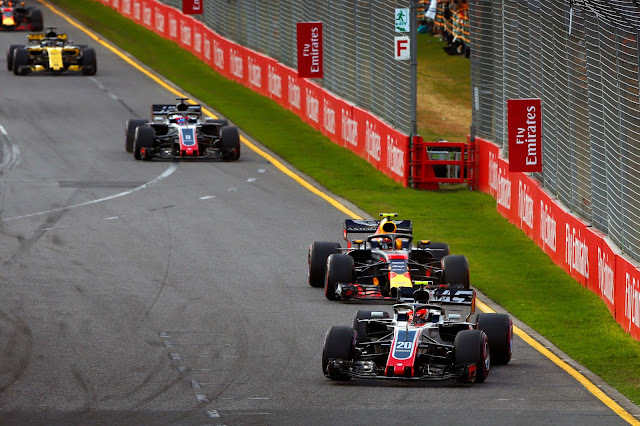 AS the laps drained off behind the Safety Car, it was announced that the left front was loose on both HAAS cars and a crushing blow for the team now came with a bitter helping of regret and agonised hindsight. Lap 31 and it was ON!! Safety Car in and Vettel retained the lead with Hamilton in the DRS of the Ferrari. Verstappen nailed Hulkenberg for P6 on the restart, with Hulkenberg pulling alongside, but ultimately unable to retake the spot. Aside from that it was status quo as the end of the lap approached. 23 laps to go and Lewis had it all to do. Purple Sectors galore for the Mercedes man, but to little effect as at the end of each lap it was Vettel, with just enough room to prevent any attempts. Bottas, further back, had taken P8 away from Vandoorne while his teammate, Alonso continued his efforts to keep Verstappen at bay, and his precious P5 in hand. Lap 38 and Hamilton dropped out of DRS on Vettel, but thankfully Ricciardo picked it up and had a proper go at Raikkonen. He kept at it the following lap, but Kimi carefully worked his way back out of danger. After a couple of laps off the boil, Lewis dropped back into DRS on lap 41 and kept up the pressure for 2 more laps, reporting a liquid from the back of Vettel's car. Not that that did him any good, as his own team mandated lift and coast to bring down PU temps, which were getting rather marginal in the heat of battle. By lap 46 Hamilton had got the temps back where they belonged and again it was into DRS he went. Verstappen meanwhile had gotten almost, but not quite, to Alonso, exciting all sorts of commentary but with an ultimate absence of result. Lap 47 and Lewis had enough, unilaterally taking the reins and after asking if he could push, declared he was going for it. But it was a rare mistake at T9, a lock up that sent him wide, taking him well out of DRS, nearly 2 seconds lost. Not easily deterred, he was immediately setting purple sectors in pursuit of Vettel. 2 fast laps in a row, in fact. 8 laps to go, and Sainz was reporting nausea from the water. Decidedly not his day, as an earlier PU issue had already done his race no favors. Lap 53 and Hamilton was back inside a second, briefly at least, dropping a couple of tenths in S2. And that was that, as he had burned his rear tires. The conclusion of the following lap saw him 3.5 seconds back and clearly on Plan B, finish with a podium. With 4 laps left, and Raikkonen 5 seconds back it was not necessarily over. 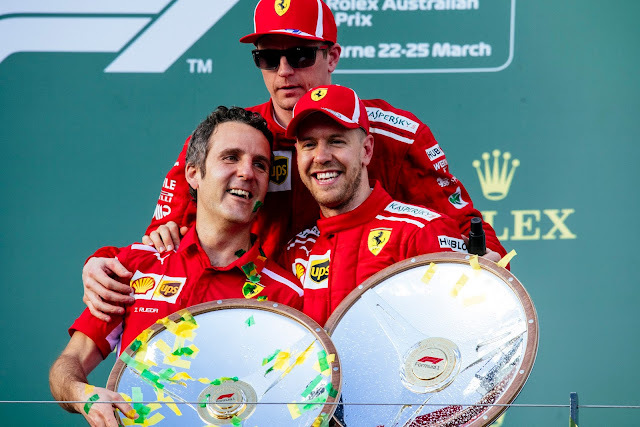 Raikkonen's pace, however, was being forced by Ricciardo, who was nearly a second faster than anyone else, his pit wall optimistically told him as he set up to give the last podium spot one more go. Penultimate lap and Raikkonen was inside 2 seconds and Ricciardo was dangling just outside DRS on Kimi. Onto the last and he was inside a second with 3 overtake presses to use and his favorite T13 looming ahead of the Finn. It was all wishful thinking, though, and they crossed the line as the chequers fell, with no change in order, Vettel, Hamilton and Raikkonen for the podium spots, with Ricciardo and Alonso down for filling out the top 5. Despite drawing first blood, it was clear that Mercedes had the faster car, though as has long been the case, under pressure and chasing it once again ate it's rear tyres. The commentariat has not been satisfied with that answer, hinting at something deeper, and in all likelihood, cooling related as Hamilton had suffered several spells of needing to back off to keep his temperatures. 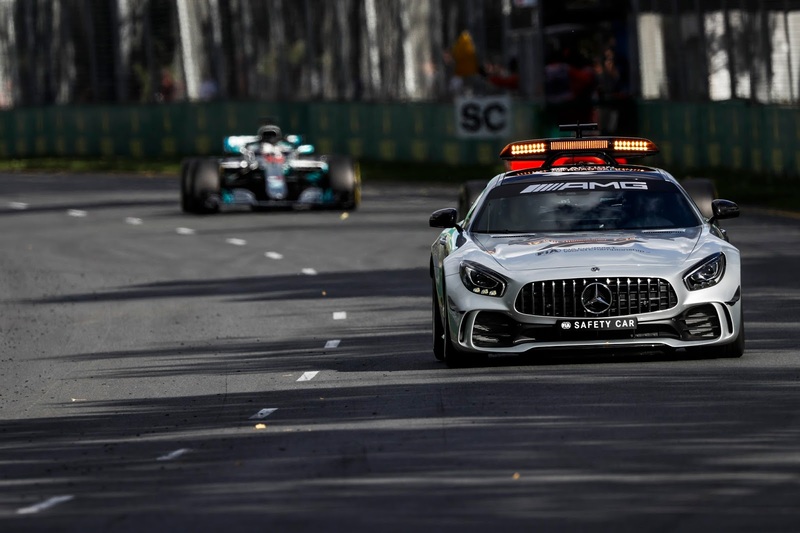 Post race, Toto Wolff confirmed that it was the VSC algorithm that let them down, quite possibly not the first time as they have given away the farm once before in Monaco, though there it was trying to take advantage of the VSC that did them in. The biggest losses seem to have been incurred by Force India, Toro Rosso, Williams and especially Sauber, whose drivers and cars appeared somehow even less competitive than the previous season, despite the infusion of cash. HAAS will be having a serious look at their left hand side wheel guns, as they were staring down at a historic result for the team till that fairly ancient tech let them down rather badly. Congrats to Ferrari, for getting it right and lest we forget, it was Bottas putting it into the wall that (likely) gave then the strategic option that won the race. It's a feature, not a bug, that often we leave Australia with more questions than answers so we'll see you in a couple of weeks to see if we can get any closer to the truth!! Great write-up, again Trumpets, and thanks to Somers for adding the pictures and publishing a great article.